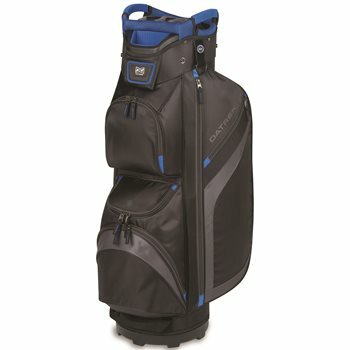 The Datrek DG Lite II cart bag is lightweight at 4.25 lbs. It features a 15-way organizer top with full-length individual dividers that help prevent club damage by enabling the separation of each club. Other features of the cart bag include the soft-grip oversized putter well that accommodates extra-large putter grips and soft-grip lift assist handles that provide easy lifting. The bag has a cart friendly base and a cart strap loop for attachment to a cart. The DG Lite II cart bag is equipped with seven pockets that include an oversized insulated cooler pocket, a fleece lined valuables pocket and an oversized ball pocket. The bag also includes a towel ring, IDS Velcro glove holder, rainhood and umbrella holder.